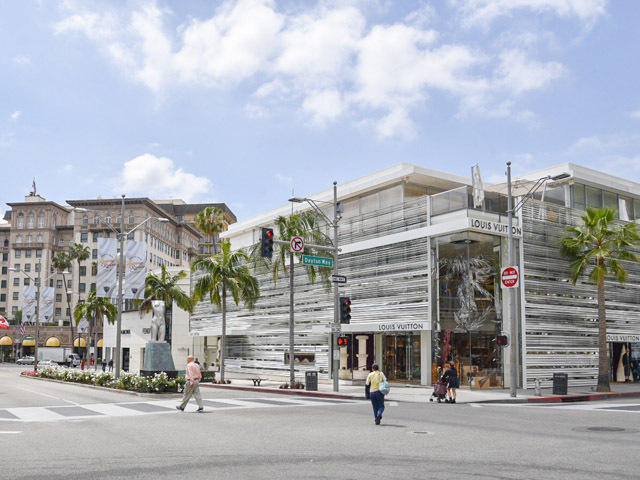 What do you think of when anyone mentions Beverly Hills? 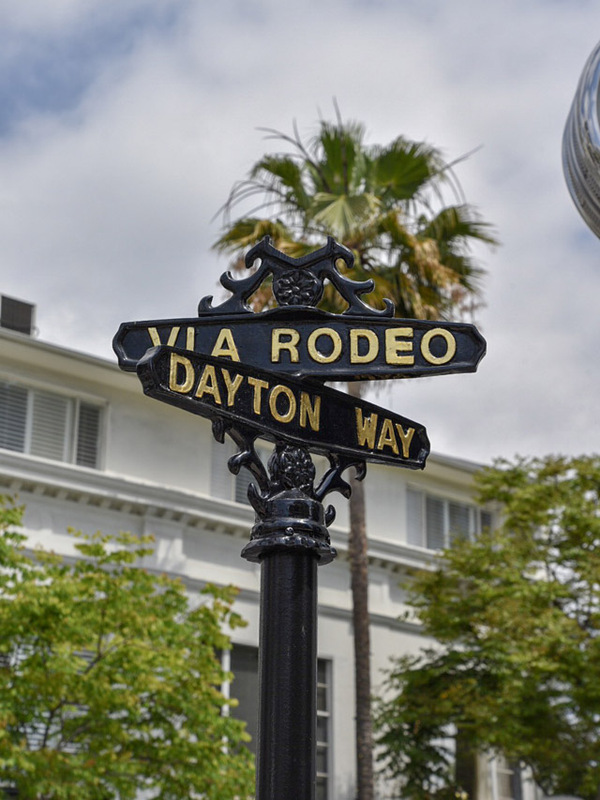 For me, it's immediately two iconic landmarks- The Beverly Hills Hotel and Rodeo Drive. 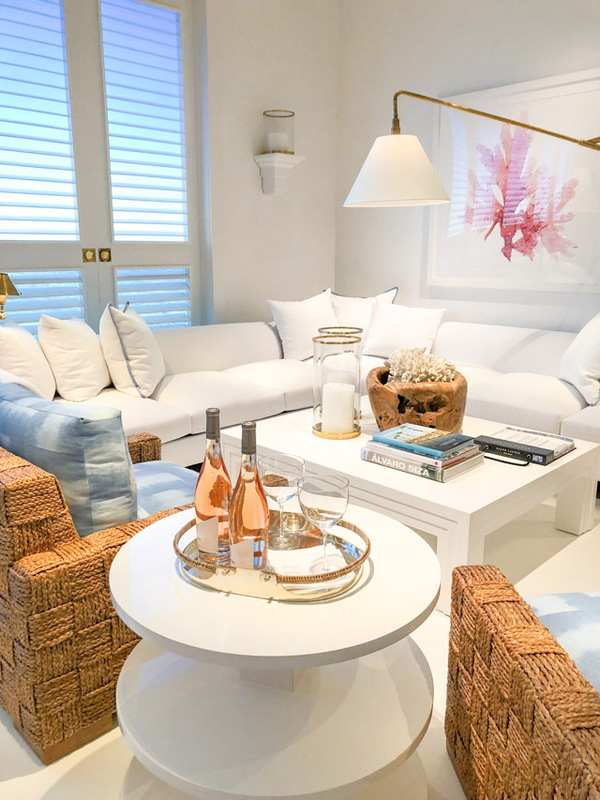 They represent that ultimate luxury lifestyle that some of us are lucky enough to dip our toes into once and a while. Of course I always like to imagine, while visiting, that this is my everyday life. I mean could you just see it? 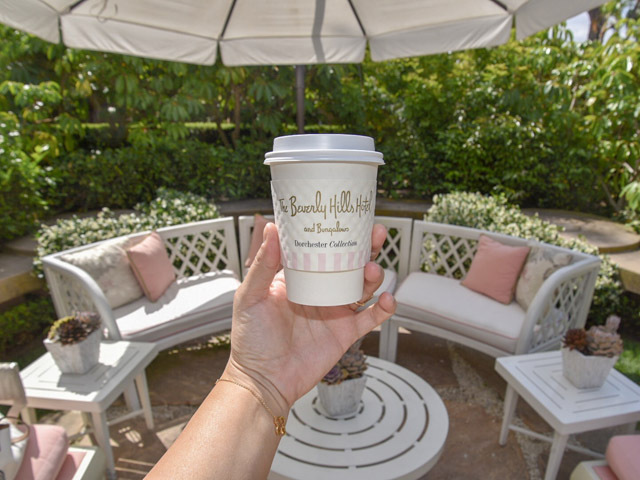 Well, luckily your imagination doesn't need to work too hard today as I'm taking you on a little tour and proving to you that a stop into Beverly Hills isn't complete without a pop into these two places! 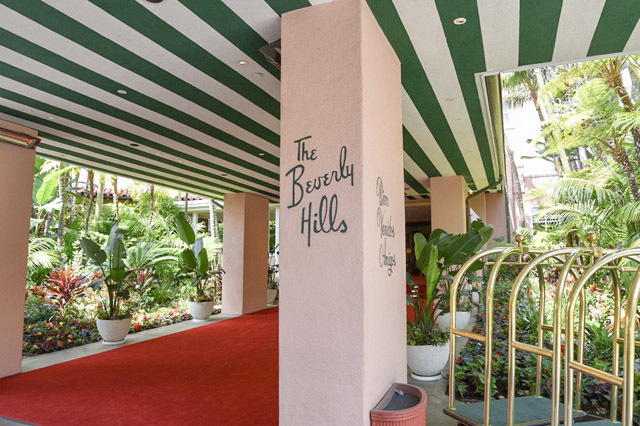 We'll start with Beverly Hills Hotel. Over three years ago now, I stayed in The Beverly Hills for the first time. It was everything I ever dreamt it would be. Banana leaf lined hallways, pink and green decorating every corner of the hotel and luxurious guests swanning around this way and that. One night here and you actually do start to believe you're part of the Hollywood set. But, as my trip in the BH was rushed this time around, my visit was shorter than usual in 2018. 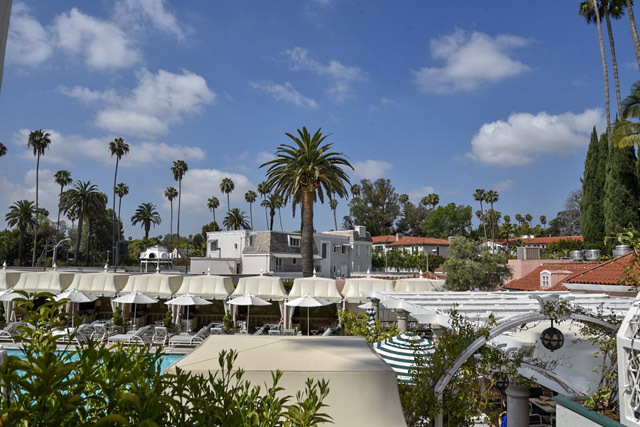 But, there was time for a quick trip to The Polo Lounge for breakfast, where of course all the power players are dining and ironing out deals left right and centre around you. It's almost impossible to concentrate on one's avo on toast as celebs brush past every other minute, casually and so matter of factly. Surreal. But, always my favourite place to grab breakfast and a take away coffee when I'm in the area. The staff here are so lovely you'll probably think you've stepped into some parallel universe. Surely no human being could be this sweet. But then again, they do get to stare at the likes of people like Brad Pitt, the Hemsworth Brothers and Ryan Gosling all day. I think I'd have a smile on my face too. 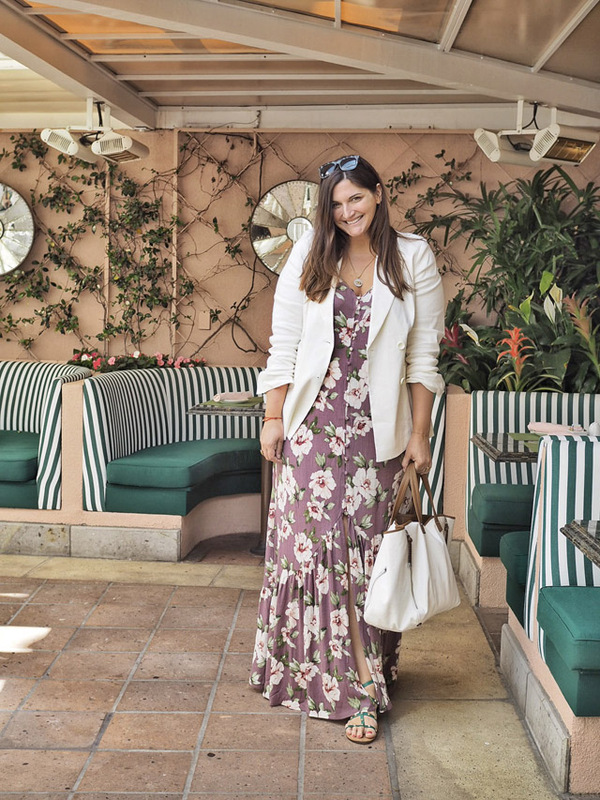 After The Polo Lounge, we made our way down to the pool area. 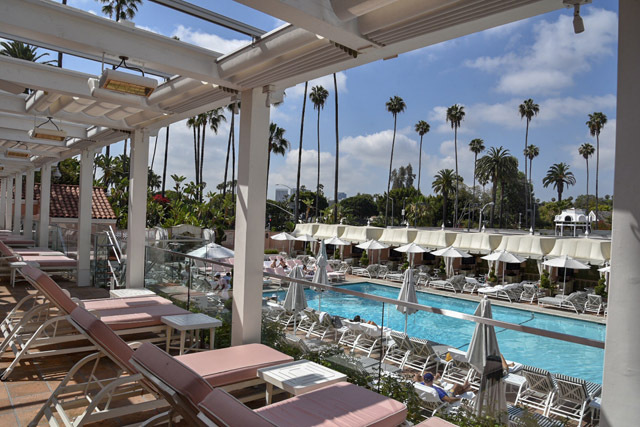 You've seen the famous Beverly Hills pool cabanas everywhere, I'm sure. 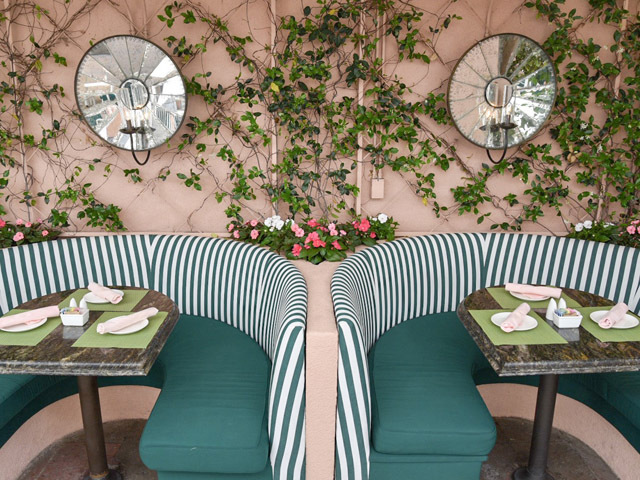 The poolside restaurant is just as iconic with it's green and white striped booths and botanical surroundings. On a sunny day, this is the place to relax and, of course, people watch like mad. Alright, I'm starting to sound like you only check in to check out the Oscar winners. In reality, everyone here blends together. It's almost as if being a guest of the hotel flattens the hierarchy. You're all at The Beverly Hills and that says enough. On our way out of the hotel, I found myself caught in the hotel gift shop. I also found myself walking out with two bags. What is wrong with me?! This is not responsible behaviour. But, I just couldn't help myself. 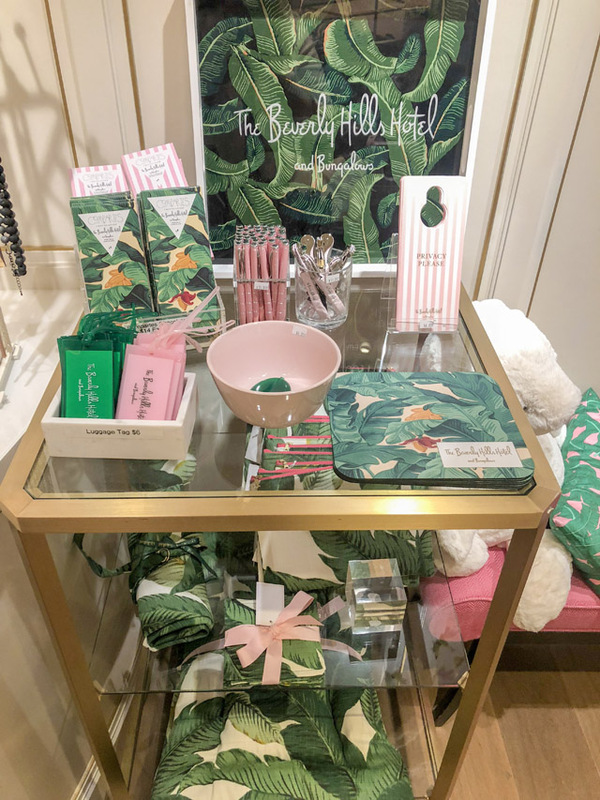 Palm Print clutches, luggage tags, water bottles and more, oh so much more, are all begging to be brought back to London as a reminder of how much I love this space. So, yes, I indulged. And I wasn't the only one. 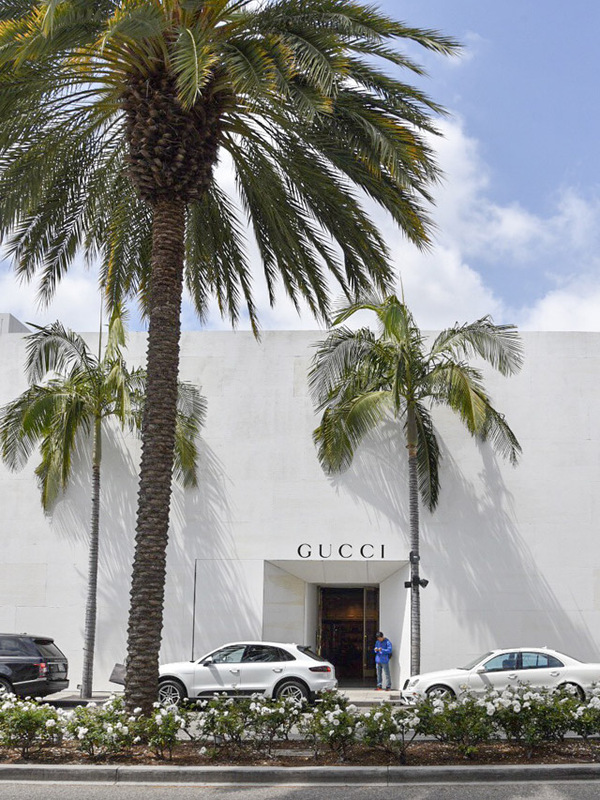 This is obviously one of the hottest shopping spots in the area, and with good reason. 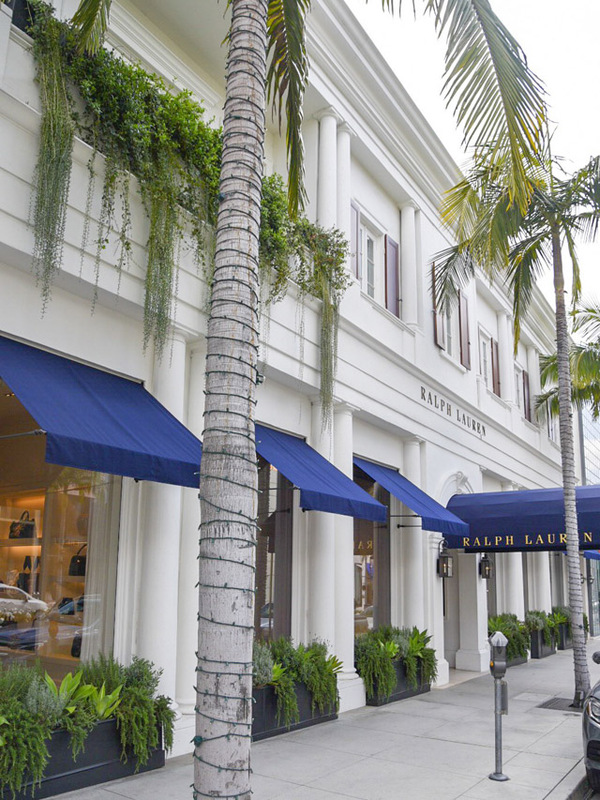 With my visit to the Beverly Hills complete, it was time to head off to the famous Rodeo Drive, just a short drive away from the hotel. My Uber dropped me off in front of Louis Vuitton and wished me luck on my shopping adventures. I didn't need any luck at all. I knew I was in trouble. 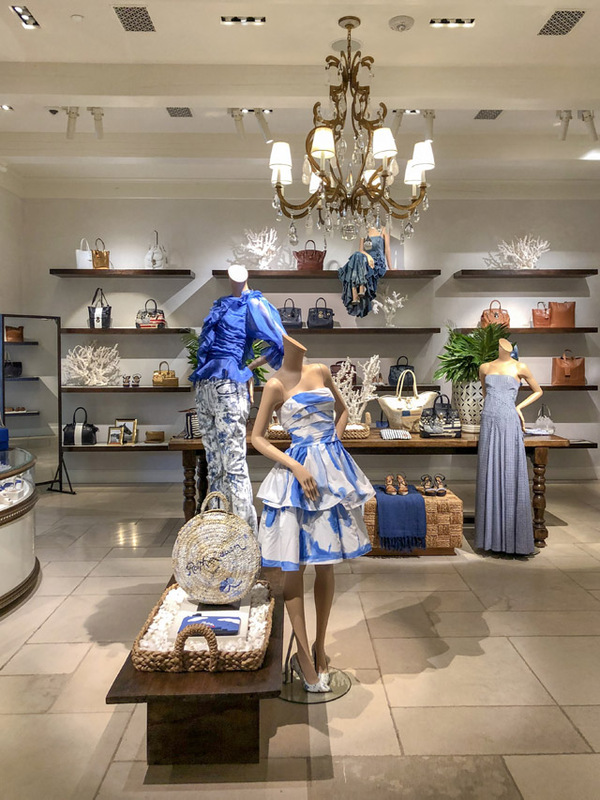 The stores here sell everything your local Louis, Ralph, Dolce and more sell, but there's something very special about the decadent interiors found with each one of these locations. This is a shopping theme park. You find yourself wanting to walk into every store, swinging bags and waiting for your Pretty Woman moment when you can turn around and say, "do you work on commission? Big Mistake, huge! I have shopping to do." At the end of the day, even if all you've purchased are your pancakes from the hotel, you'll feel as if you're a decadent millionaire living in a billionaire's playground. Dress up, have fun with this part of town and flaunt what your momma gave you (be that a vintage bag or a a height of 6'2....thanks mom!). And for heaven's sake, take advantage of all the picture opportunities. Every corner is too beautiful to play it cool. 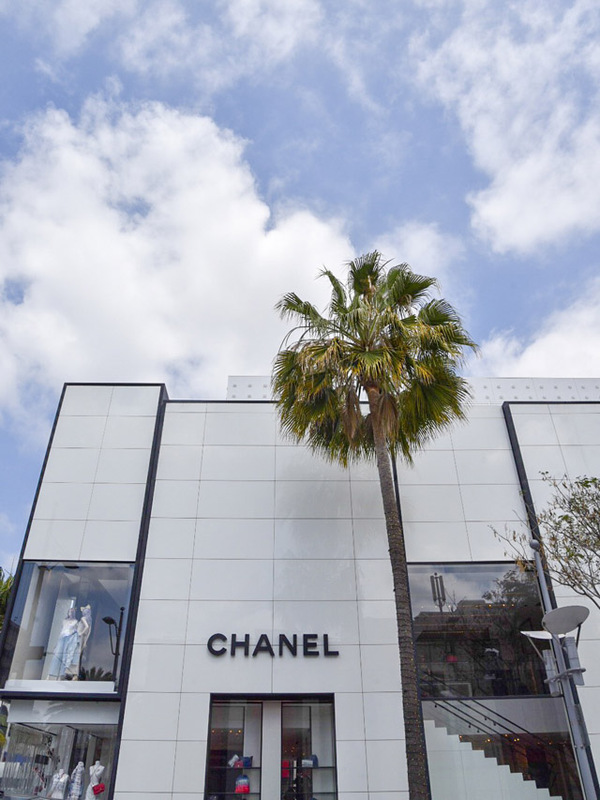 Get lost in Beverly Hills and I'm pretty sure anyone will be able to tap into their love of luxury. Oh... and my best tip for anyone roaming Rodeo is to find a coffee shop or restaurant with seating outside. 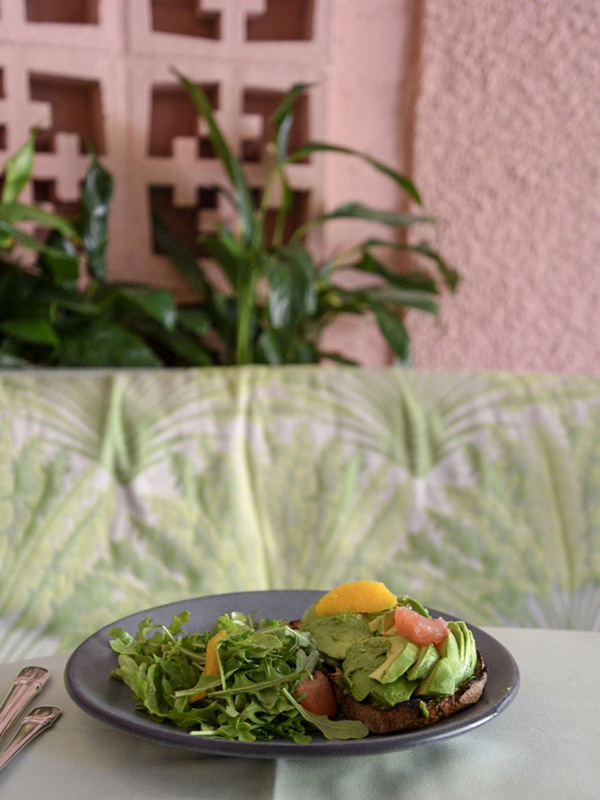 Order lunch or just a coffee and sit back and people watch. 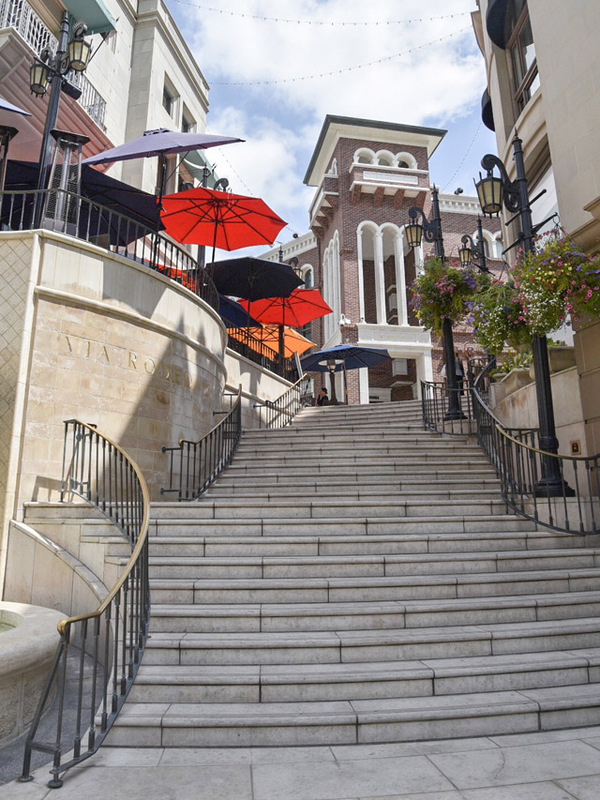 The residents of Beverly Hills are worthy of your up and down glances. Some of the outfits are truly inspiring and I'll openly admit I was drooling over handbags swinging to and fro down the streets. Oh to be a BH girl!